Twice in recent months, drug makers have purchased priority review vouchers that can be used to obtain faster FDA reviews for medicines being developed for certain diseases. One voucher was issued to spur development of treatments for rare pediatric diseases and the other had been issued to provide incentives to create medicines for neglected tropical diseases. In the most recent sale, Knight Therapeutics sold a neglected tropical disease voucher to Gilead Sciences for $125 million. The deals marked the first time these vouchers were sold, but while the voucher program has won praise, critics say the program does not do enough to ensure drug makers develop needed medicines. A bill is before Congress to add Ebola to the list of neglected tropical diseases, which Judit Rius, the U.S. manager and legal policy adviser for Doctors Without Borders/Médecins Sans Frontières (MSF), says should be strengthened. This is an excerpt of our conversation. Pharmalot: First, what do you think is good about the voucher program? Rius: It’s good that the US created an incentive not based on extending market exclusivities. By that, I mean a monopoly for distributing and manufacturing a product in exchange for investing in underfunded R&D, such as neglected tropical diseases. There’s a lot of suffering caused by these diseases and there’s no appropriate treatment – vaccines or diagnostics – which additional development could alleviate. And that’s why it’s important to create incentives to promote innovation. Pharmalot: But you believe it could be improved. What do you think needs to be done? Rius: Until the Gilead deal, it has arguably not been incentive enough to promote innovation. We’ve twice written to Congress to complain. The Gilead deal does not involve billions of dollars, but the fact that a company receives $125 million shows it has some economic value. What we propose is that the mechanism be fixed. We asked Congress to do so in four different ways. Congress is trying to act on it in two ways, but is ignoring another two ways that we suggest. Rius: We need to increase the potential economic value by making the voucher for neglected tropical diseases transferable indefinitely, instead of only being able to transfer a voucher just once. For rare pediatric diseases, a voucher can be transferred without any limit. Congress should extend this to neglected tropical diseases as well, because companies can keep trading a voucher and, theoretically, raising the economic value. The bill we’ve seen that Congress is looking at doing this. Rius: We see a problem when a voucher has been awarded to a company that has not invested in new R&D or a new product. There are several examples in which companies have received vouchers (from the federal government) that, we think, have not deserved it. If you don’t do innovation, you shouldn’t get a voucher. Companies should demonstrate they have made a significant investment before receiving a voucher. Pharmalot: Explain how a company can be awarded a voucher if they have not done the work. Rius: The way the mechanism works is that a company isn’t required to provide proof that there was basic research and development, such as investing in clinical trials to bring a new product to the market. The voucher is supposed to be an incentive for innovation. The deal with Gilead is an example. The company that got the priority review voucher is Knight Therapeutics, but the product, Impavido, has been available for many years in other countries [to treat leishmaniasis, a parasitic disease spread by sand flies]. So if a product is already in the market, then there is no innovation taking place. What this company has done is nothing new – the product was already in use to treat the disease in many countries. The company simply registered the product in the U.S. and then got the incentive – in the form of a voucher – from the government. It’s like gaming the system. It’s unfair [for the government] to give an economic benefit for not doing anything. Editor's Note: Paladin Labs bought the drug in 2008 from Aeterna Zentaris. When Endo Pharmaceuticals bought Paladin earlier this year, Jonathan Goodman, a Paladin co-founder, formed Knight Therapeutics to retain rights to the drug in the U.S. Goodman says that Paladin spent $10 millions to obtain FDA approval over a four-year period, which involved “significant investment, time and risk,” although he could not say how much was spent on R&D. Spokesmen for Endo and Aeterna could not provide any information on R&D spending. Pharmalot: So you’re saying Knight got a voucher that is supposed to spur R&D, but neither Knight nor Paladin did R&D and Knight got a voucher anyway? Rius: Yes, exactly. But there’s another problem. There’s no guarantee these products will be accessible to patients anywhere in the world – the U.S. or globally. There is no mandate. 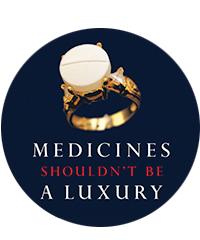 Congress gives the reward, but there is no guarantee these [medicines] will be affordable. Paladin and Endo have exclusive rights globally and Knight has exclusive rights in the U.S. But the product has been in the market for many years and there is nothing to say it will be accessible. Pharmalot: So you’re saying that the existing price is out of reach for many patients? Rius: Yes, but Congress is not addressing this. They’re looking at a bill that would extend the voucher to include Ebola as a neglected tropical disease and this would increase the value of a voucher to pharmaceutical companies. But Congress is not looking at anything that will ensure any product is accessible. And the bill does not require a company to invest in new R&D for a new product. So Congress is doing nothing to ensure the mechanism will not be gamed again. Pharmalot: What do you believe Congress should do then? Rius: They could reward companies that only invest in R&D and require they disclose their pricing strategy. Ideally, this would make sure [a medicine] is affordable. And the companies should only be eligible for a voucher if they explain these two points. The program is a good idea, but it needs to be improved. Incentives are good, but they should work. Right now, this is a huge missed opportunity. By including Ebola in the list of neglected diseases, the bill is getting a lot of attention. But we need to fix these loopholes. The sale to Gilead shows there is value, but it can be used to generate innovation, which is it not doing. And we could have more medicines for diseases that are being neglected by companies. So it could be very important from a public health perspective.